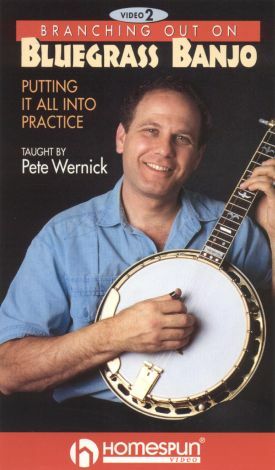 Homespun Video presents Branching Out on Bluegrass Banjo 2: Putting It All Into Practice, an instructional DVD taught by Pete Wernick (aka "Dr. Banjo"). Wernick teaches viewers the "big tree of licks," which includes ascending and descending runs, key modulations, back-ups, how to create breaks in certain keys, how to develop complete bluegrass solos, and more.